MSI setup package to EXE converter software converts your Microsoft Visual Studio .NET framework MSI installer files into EXE format Installer setup without affecting the original structure of MSI file in just few seconds. MSI to EXE installer setup package builder utility is a professional solution to convert Microsoft Window installer application .msi file into executable .exe setup package and provides wizard like easy interface facility to save converted exe setup at any user specified location in your computer or any other storage devices. 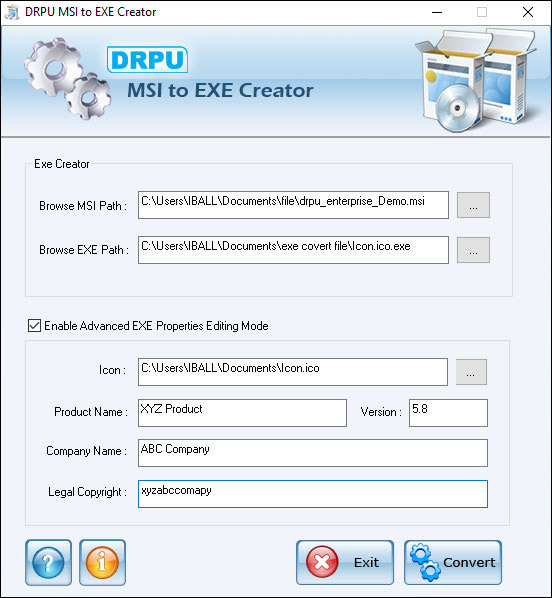 MSI setup to EXE package maker application generate EXE file without changing originality, functionality, structure and working of the MSI package. Windows installer MSI file to EXE creator utility provide attractive graphical user interface to use and operate the software. MSI to EXE setup generator tool is powerful and non-destructive application that does not require any technical knowledge to operate software. MSI package to EXE setup maker utility supports all Microsoft windows operating system edition including 98, 2000, server 2003, NT, ME, XP and all available versions of Vista. MSI to EXE builder application is helpful utility for software developers or programmers for creating .exe file from .msi setup file. Features: *MSI to EXE Setup generator software converts executable .exe setup package in highly reliable and efficient manner. * MSI installer to exe installation package provides user friendly GUI facility and does not require any technical knowledge to operate it. * Professional MSI to EXE convertor utility uses advance algorithm for setup conversion process. * MSI to EXE setup package converter software provides consistent help manual for understanding the installation and operational process. * MSI installer to exe installation setup maker software enable user to save the created EXE file at a specified location in your computer.